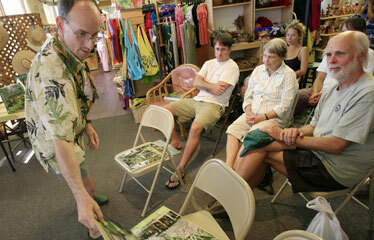 Craig Elevitch thumbs through his reference book "Traditional Trees of Pacific Islands: Their Culture, Environment and Use" at a lecture held at Native Books/Na Mea Hawaii. The manual is a handy guide not only for identification purposes, but also for planting, harvesting and conserving tropical trees. Craig Elevitch has quite the tome to show for his four years of research on the trees of the Pacific region. The Big Island resident has accumulated a massive guide to 80 trees, and in addition to providing descriptions, he also provides the answers to questions a curious reader might have along the way, such as, Where do the trees grow best, and how does one care for them? "Traditional Trees of Pacific Islands: Their Culture, Environment and Use"
All but a few hundred of the 2,000 copies of "Traditional Trees of Pacific Islands" have been sold since its publication last July. The book was published through Elevitch's own company, PAR, with the help of several sponsors, including the USDA Natural Resources Conservation Service, the Hawaii Department of Land and Natural Resources Division of Forestry and Wildlife, and a grant from Kaulunani, an urban forestry program. The trees were included at the recommendation of 75 experts throughout the Pacific; 31 contributing authors wrote summaries of each species. Chapters are devoted to "the most important species and high-priority plants," said Elevitch. Some 800 color photos of both young and mature plants accompany the text of the guide. 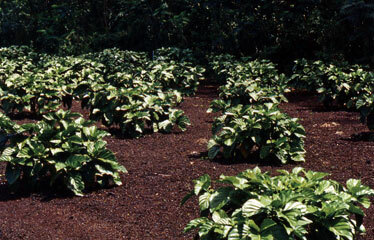 Commercial crops of noni. 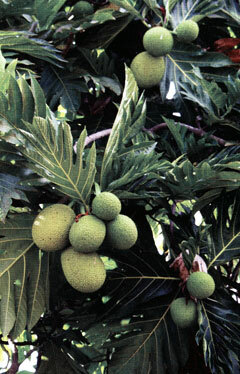 An example of a breadfruit tree. Other types of plants also receive coverage, including the slow-growing ohia lehua, found on six of the Hawaiian Islands; the adaptable noni, native to Southeast Asia and Australia; and the breadfruit tree, cultivated in the region for nearly 3,000 years. "The breadfruit tree can produce enough food for quite a few people," said Elevitch. "It's one of those trees that's identified with Hawaii and Polynesia, and it's important to preserve them." Considered a manual for extension agents and farmers, Elevitch says he wrote this, his sixth book, not only for professionals, but for "anyone who is interested in traditional trees of the Pacific, economically, culturally and (from a) conservational (standpoint)." "Traditional Trees of Pacific Islands" is available at Native Books/Na Mea Hawaii and at Borders.